12 Şubat 2019 Salı 14:01 - 6 reads. A miracle happened on Sunday 10. February Paholpolpayuhasena Hospital in Kanchanaburi in Thailand. 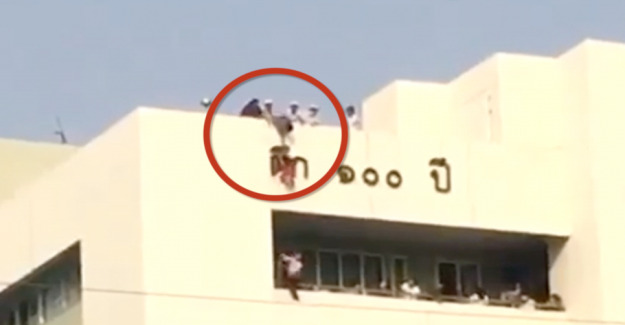 A little girl was hospitalized, but she decided to go for a walk in the hospital and ended up having to hike up on the roof. Here she found supposedly a lizard, as she began to hunt. The hunt led her out on the side of the building, where she lost balance and fell down. Miraculously grabbed the dress hold of one of the letters that adorns the façade of the hospital, and the girl hung now firmly on the side of the hospital. Attention citizens were, however, quickly spot the girl, and fortunately it ended well by the fact that a woman managed to pull a unharmed but frightened girl up. - We checked the girl for injuries, but we found no serious ones. She had only bruises and abrasions, said hospitalsdirektøren Somjed Laoluekead after the incident. See the rescue in the video at the top of the article.